In the face of Tuesday night’s blizzard conditions, Hormel Food Corps. President and CEO Jim Snee told those who did show up for the annual shareholders meeting that the company was the strongest it’s ever been. “We are reinvesting record capital back into the company,” he told the crowd from the stage in Knowlton Auditorium at Austin High School. Snee went over a very successful 2018 that showed a company growing faster than it ever has before. He reported that the company saw profits of $9.55 billion in 2018, which was up four percent from the year before and which saw market shares rise $1.83 a share. Snee explained that the growth was pushed by its refrigerated foods and international sections, which both showed growth in 2017. “It demonstrates how we are reinventing the center of the store,” Snee said. Of the more notable items discussed at the meeting was an explanation by Vice President of Consumer Insights and Corporate Innovation Scott Aakre of a premier step by the company going forward into the future in terms of meals. 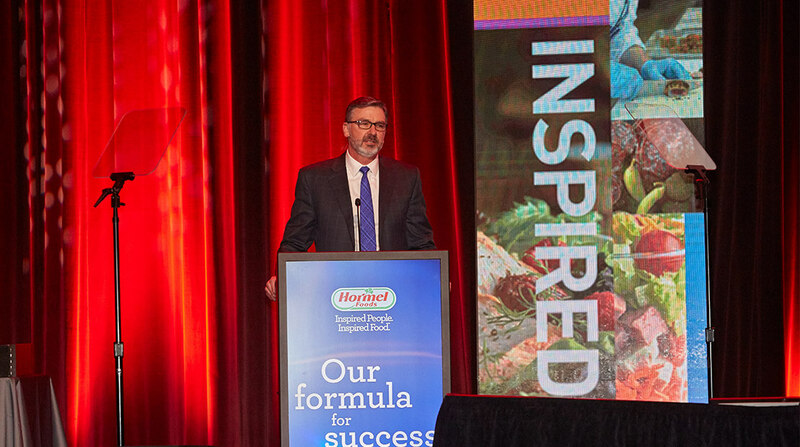 Explaining that the future of food included more snack-type foods, Aakre said Hormel is stepping up to meet the demands of the market. “People want snacks that acted as meals,” Aakre said. Specifically, he pointed to the evolution of Natural Choice Snacks that have expanded within the line to offer more for the public.